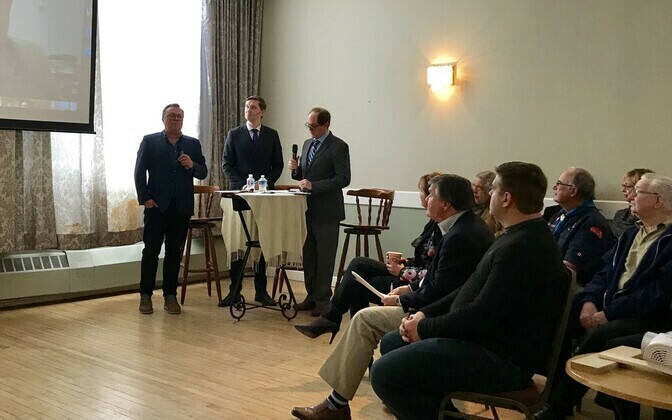 On Sunday, 10 February, representatives of seven Estonian political parties participated in a town hall discussion at the Toronto Estonian House in the run-up to the 3 March Riigikogu elections. The discussion focussed on how the Estonian government might better engage with Estonians and their communities across the globe, and how to maintain and strengthen their connections to Estonia and their Estonian identity. There are an estimated 200,000 Estonians living abroad, including many whose ancestors fled Soviet occupation or emigrated from Estonia even earlier. They have built community centres, schools, youth camps, churches, festivals and other organisations that actively promote and uphold their Estonian heritage. While many of these Estonians hold Estonian citizenship — including those whose ancestors left the country many decades ago — electoral participation tends to be quite low, despite opportunities to vote digitally. Participating politicians in the town hall included Andres Herkel of the Free Party, Eerik-Niiles Kross of the Reform Party, Jaak Madison of the Conservative People's Party of Estonia (EKRE), Sven Mikser of the Social Democratic Party (SDE), Meelis Niinepuu of Estonia 200, Urmas Reinsalu of Isamaa, and Imre Sooäär of the Centre Party. Of the seven participants, all participated via online video chat, with the exception of Mr Madison, who was present in Toronto. Raising the event's profile was the participation of two prominent Estonian cabinet ministers: Mr Mikser, the current Minister of Foreign Affairs, and Mr Reinsalu, the current Minister of Justice. Moderating the panel were Marcus Kolga, President of the Estonian Central Council in Canada (EKN) and a prominent leader in the Canadian-Estonian community, and Dr Andres Kasekamp, a former professor of the University of Tartu and current Chair of Estonian Studies at the University of Toronto. Estonian Honorary Consul General in Toronto Laas Leivat provided opening remarks, touching upon commonalities among Estonians abroad and stressing that the right to participate in Estonian elections comes with the responsibility to do so. According to Mr Leivat, "Every vote that is left unused can increase the influence of votes that do not care about the Estonian language, culture, nation or the state's security and independence." In a rebuff to those members of the global Estonian community who might avoid voting, contending hat they know little about Estonia or its politics, he reminded the audience that the internet makes all relevant information accessible. The internet and digital innovation have been central to Estonia's success since its reindependence. Given this, Mr Kolga raised the importance of the new online Global Estonian portal, which was created by Canadian Estonians and gifted to the Estonian people as part of Estonia's centenary. The initiative offers a free online global community and network for Estonians and friends of Estonia around the world, providing a potential complement to Estonia's existing e-Residency programme. Yet digital themes did not dominate the panel discussion, which comprised four questions: two from Mr Kolga, and two from Dr Kasekamp. Politicians responded individually in two minutes or less, elaborating on their party's position on the respective matter. Mr Kolga focussed on the global Estonian community, asking how important Estonians abroad are to Estonia, and how to better engage with these Estonians. He also asked whether or not the respective parties support building a greater knowledge in Estonia, such as in school curricula, of the global Estonian community and its history. Much of the discussion was devoted to issues related to dual citizenship, which is technically not allowed under Estonian law. Many Estonians abroad and their descendants, however, hold dual citizenship of both Estonia and their country of birth. Dr Kasekamp inquired more generally, asking about how the interplay between values and interests should influence Estonian foreign and security policy as well as each party's vision for Estonia ten years from now, including the country's place in the world and the development of its society. Questions were then taken from the audience, including questions sent from across the world. Among other topics, these questions touched on the extent to which it is possible to be Estonian without speaking the language, the future of Estonian IT and digital excellence, better engagement with Estonian citizens abroad regarding military service, and preventing tax flows from Estonia. The bulk of the discussion occurred in English, though questions from the audience were mostly answered in Estonian. 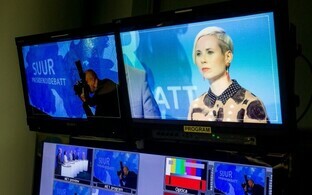 The event was streamed live on both ERR and Postimees via YouTube. Final figures have not yet been released, but on Sunday alone over 500 people watched the ERR livestream, and over 400 watched it on YouTube. Nearly 2000 people watched the Postimees stream, which was shared just under 200 times on Facebook. 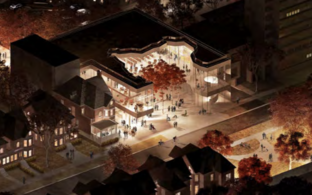 The town hall was organised by the Estonian Central Council in Canada in cooperation with the Union of Swedish Estonians, the Estonian American National Council (ERKÜ), the Association of Australian Estonian Societies and the Estonian World Council (ÜEKN). Over two dozen Estonian organisations were represented in the audience. Reactions to the town hall by organisers and attendees alike were positive. Reached for comment, Mr Kolga was pleased. "The town hall blew away my expectations — there were hundreds of viewers online, and we'll wait to see how many others watch it in the days leading up to the elections," he said. Noting the participation of all major parties and the two government ministers, he added that "this is definitely a positive sign for future cooperation with whomever forms the next Estonian government." Dr Kasekamp was likewise satisfied. "I was pleased — and somewhat surprised — that all the party representatives were generally optimistic and positive about Estonia's future and did not engage in any mudslinging amongst themelves," he said after the event. A similar event was organised four years ago ahead of Estonia's previous Riigikogu elections, but with fewer participating parties and a much lesser international reach. Estonian citizens abroad can vote in Estonian elections via various means, including online, via post, as well as at local embassies or consulates. For more official information on how to vote abroad, click here.